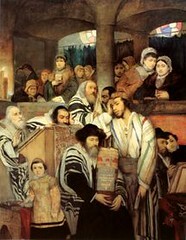 Yom Kippur, the Jewish holiday marking the end of the High Holy Days and a Day of Atonement, begins at sundown with the Kol Nidre service. You can watch a live service online at 6:00 pm ET. You can even download the prayer book here to follow along. The service will be conducted by Rabbi Naomi Levy. It is expected to reach 200,000 worshippers around the world. The live service will emanate from Brentwood Presbyterian Church and will be transmitted via the broadband channel of the Jewish Television Network. The service will also be available subsequently on demand.